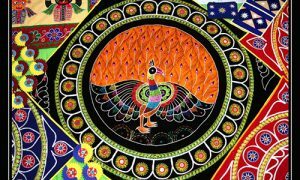 Odisha, the land of dexterous artists and craftsmen, possesses a rich artistic tradition which enjoyed liberal patronage from the temples as well as the nobility. Diverse and varied, the enthralling craft-work of Odisha depicts the magic of the deft hands of these artisans and puts forth a perfect medium to get a glimpse of the spectacular world of a craftsmen’s imagination. An appliqué is ornamental needlework in which pieces of fabric in different shapes and patterns are sewn or stuck onto a larger piece to form a picture or pattern. This technique is very common in some kinds of textiles, but may be applied to many materials. In the context of ceramics, for example, an appliqué is a separate piece of clay added to the primary work, generally for the purpose of decoration. The term originates from the Latin “applicare” and subsequently from the French appliquer or “apply”. Appliqué is a technique used to decorate an aspect of a garment or product. The technique is accomplished either by hand or machine. Applique work in Odisha also originated as a temple art. The artisans of Pipli have their mastery in applique art. Here colored cloths are stitched in various shapes. Saris and other attires are designed with applique work, which has gained a lot of popularity in International market. Tiny mirrors are stuck or stitched by thread embroidery to create a remarkable work of art. Dhokra or bell metal craft is a tribal craft that combines metallurgical skills with wax technique to create things of distinctive beauty, practiced for over 4,000 years. It is thus a very old form of craft that is still practiced in some parts of Odisha. These tribal crafts people express their special worldview through their whimsical creations. Made from paper, waste cloth and different kinds of natural fibres, Paper Mache skill has been creatively practiced by crafts persons from all over Odisha since long. Masks, hand bags, toys are produced out of specially made papers in Odisha that are not only beautiful but strong and durable as well. The inception of this art has been more than a century ago and its popularity has only grown year after year. Many utility as well as decorative things are made in this form and mostly the finished products look like the Filmfare lady. Black and beautiful! The surface throws off a dark somber sheen which catches the attention of all art-lovers. Parlakhemundi and Cuttack are famous for this artwork. This art originated when written communication began. Messages and manuscripts were written on the palm leaf to be disseminated. Gradually the trend to decorate the text with images began and that became an art in itself. It is mostly practiced by the artists primarily residing in Puri and Cuttack. The technique of Ikat is the tie and dye process which has trickled down from the Indonesian culture. Weaving in this technology started in Odisha. Although Odisha has adopted this process yet it has its own style of designing. Manually done, the intricate method of Ikat is subject to tying in sequences and dyeing the required areas in particular colors. Among the state’s greatest contributions to the arts and crafts of the country are the artefacts made from coir fibre. The lightweight, yellow coloured fibre is moulded into animal and bird designs as well as decorative items. Some of the popular animal figures include horses, crocodiles and dinosaurs. A true collector’s delight, these bottles are painted in captivating Odisha art, depicting scenes from the life of Lord Krishna. Unique, with a burst of colours, they make an irresistible buy. This work is traditionally done by the tribal. They use special type of clay and design to match their skills. 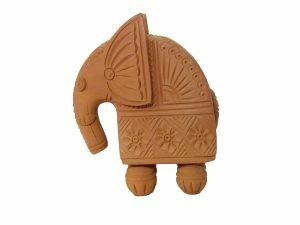 Popular items are roof tiles and utensils such as plates, khullars or the earthen tea cups, jars and many other kitchen items. Artists prepare many items most of which they outline and highlight with colours. However, in most cases the finished is left with the natural terracotta colour. Animal figurines of bulls, elephants and horses are also elegantly molded in very natural strong forms.